Dine under swaying palm trees and sip frozen margaritas on the waterfront veranda of the campground's pub. Even your family pet will have fun at the pet playground specifically designed for them. Ever-appealing Key West lies just 14 miles south. 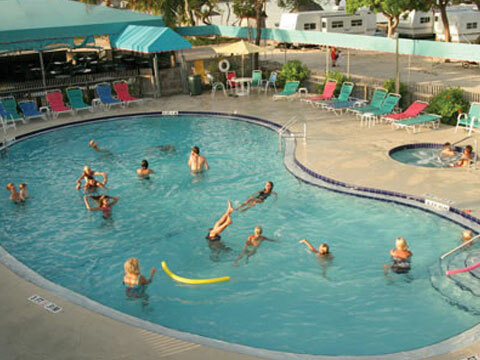 Set between the crystal clear Gulf of Mexico and the Atlantic Ocean, Sugarloaf Key/Key West KOA is a true beachfront resort. You'll find amenities and activities designed to please everyone in the family, including ecotours and sunset cruises in the Gulf, local fishing and beachside fun at the campground's own water haven. Hop on the campground's shuttle to this funky and historic end of the road, dubbed "the Conch Republic." Walk the narrow streets showcasing Conch architecture-breezy wood houses with lush tropical gardens-once home to pirates, treasure hunters, sailors, novelists like Hemingway and songwriters like Buffett. End the day with a sunset at Mallory Pier.